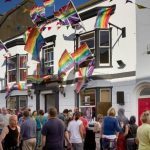 The Pride Village Party will remain in St James’s Street despite objections from some residents, councillors decided today (Thursday 7 March). They debated the merits of moving one of the biggest public parties of the year to Madeira Drive but decided against it. Conservative councillor Robert Nemeth criticised the way that residents had to wear a wristband to reach their homes when the party was taking place. Members of the Kingscliffe Society, which represents the community in the St James’s Street area, had raised the issue. They were also concerned about public safety, including “means of escape” should the need arise. A public consultation was carried out by Brighton and Hove City Council about where the party should be held. More than 2,800 people responded, with more than 68 per cent saying that it should stay in St James’s Street. The decision to stick with the current location was made by the council’s Tourism, Development and Culture Committee at Hove Town Hall this afternoon. Councillors were told that the party became a ticketed event to try to keep better control of numbers. Councillor Nemeth was also not keen on stamping hands to give people access. The council’s head of safer communities Jo Player said that the council was discussing the wristband issue with Pride while Conservative councillor Joe Miller suggested reasonable alternatives such as utility bills or a driving licence. There were also complaints about rubbish in side streets although it was acknowledged that St James’s Street was cleaned well. Conservative councillor Mary Mears said: “I don’t live around that area but if I did I would be very anxious about the complaints that have appeared before us. In response Ms Player said that representatives from Pride were in the area and rubbish collections were carried out throughout the day during the event. Labour councillor Nancy Platts said that she did not recognise some of the complaints as she found the streets clean and she had experienced the security checks when entering St James’s Street. She was particularly against moving the party from St James’s Street on economic and equality grounds as the area is at the heart of the city’s gay community. Councillor Platts said: “If it moves to Madeira Drive, it would not be local traders who benefit as it would bring in outside traders, taking profits outside the city. Green councillor Phélim Mac Cafferty said that he had several friends who lived in the area who looked forward to the Pride Village Party. He felt that the complaints were inaccurate as he had seen street cleaning in action with his own eyes but he caled for an end to plastic bottles being left in the streets. Councillor Mac Cafferty said: “If you go to Europe to one of the big festivals, you get one reusable cup and it cuts down massively on waste in the street. Curiously, the Agenda printed the bizarre ranting objections, complete with the address of somebody who sent in a scrawled effort. This was different from the considered one by a mother who had trouble getting home with her new-born child. The whole ‘Pride’ day is an embarrassment..
Time to tone it down and stop using the day as an excuse for hedonism, violence and lawlessness..